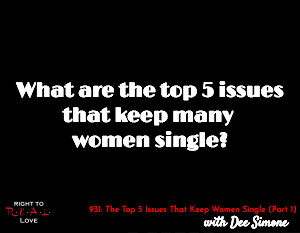 In this episode, Jay is joined by author, dating coach and motivational speaker Dee Simone to address the question: What are the top 5 issues that keep many women single? What are the top 5 issues that keep many women single? Common excuses women make for being single. The danger of blaming others for our issues. The top 5 issues that keep many women single. The importance of dealing with emotional baggage. How to identify emotional baggage you may have. Sayuri shares how much it costs women to be in the stripping profession. Acknowledge your role and the issues you may be experiencing; don’t play the blame game. Take time to talk with God about areas or issues that may be hindering you from living a fulfilling and thriving life.